A box of ammunition like this one fell out of a military chopper over Miami-Dade County Wednesday night. File this story under, oops. A military training exercise was being held in northwest Miami-Dade County Wednesday night and as the military helicopters were flying overhead, a metallic box containing ammunition fell off one of the choppers. The exact location of where the ammo touched down isn't known. 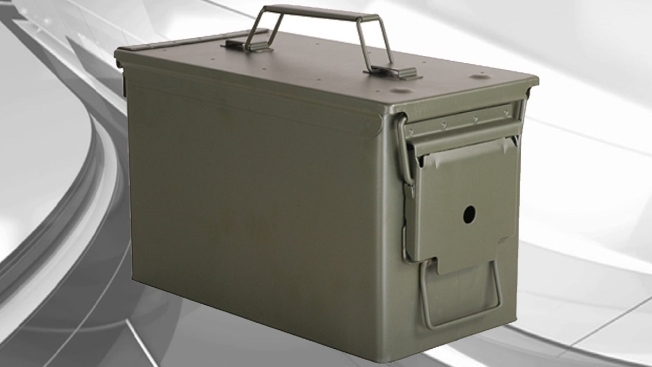 The ammo box was later found, Miami-Dade Police said. Earlier this week police announced military exercises were planned for Miami-Dade and Broward counties as part of training for operations in urban settings and to prepare for potential overseas deployment. That announcement said there would be simulated gunfire and widespread use of helicopters. The locations were chosen to minimize any disruption on local residents. The military exercises will continue as planned, police said.